SRM University commemorated the success of its 2015 grandaunts during the 11th Convocation on November 7th, 2015 at Dr. T. P Ganesan Auditorium, Kattankulathur Campus. There was a gathering of academic excellence where in presence of esteemed chief guests brought remarkable significance to the event. The Founder Chancellor, Dr. T. R. Paarivendhar, headed the convocation ceremony. The President of SRM University, Dr. P. Sathyanarayanan, welcomed the gathering with his welcome address. He expressed his gratitude to the Chief Guest, Shri Nara Chandrababu Naidu and introduced him as "Common man's C.M, Hitech C.M and CEO of Andhra Pradesh". Vice Chancellor of SRM University, Dr. Prabir Bagchi, put forward the Annual Report and also highlighted some of the commendable students' and faculty achievements in placement, research and in contribution of pioneering ideas. Honorable Founder Chancellor, Dr. T.R. Paarivendhar, declared the convocation open and invited the Chief Guest, Honorable Chief Minister of Andhra Pradesh, Shri Nara Chandrababu Naidu. The Chief Minister of Andhra Pradesh delivered his convocation address. During his inspirational convocation address, he expressed his happiness and wishes to the students. During the event 35 candidates of Doctor of Philosophy, 5486 candidates of Bachelor of Technology, 92 candidates of Bachelor of Architecture and 37 candidates of Bachelor of Design, 14 candidates of Doctor of Philosophy, 10 candidates of Doctor of Philosophy in Medical Stream and 4 candidates of Doctor of Philosophy in Health Sciences stream were awarded their degrees. Honorable Chief Minister of Andhra Pradesh, Shri Nara Chandrababu Naidu conferred the degree to the research scholars and the rank holders of various engineering, science & humanities, medical and health sciences streams. 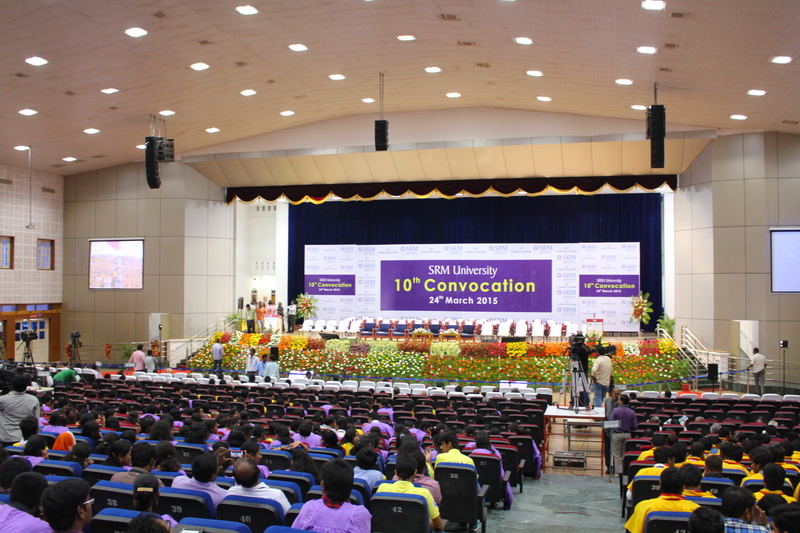 SRM University celebrated its Special Convocation on November 8th, 2015 at Dr. T. P. Ganesan Auditorium. Vice Admiral (Retd), US Navy, Dr. Ann. E. Rondeau was presided over the function as the chief guest. Founder Chancellor Dr. T. R. Paarivendhar declared open the Special Convocation and invited the Chief Guest Dr. Rondeau to deliver the convocation address. Followed by the convocation address, the awards were presented to the successful grandaunts. 49 students conferred Master's Degree, 1298 students conferred their Bachelor's degree, 237 students received their Diploma, 159 students conferred their Master's Degree in Medicine and Health Sciences, 7 students conferred their Master of Philosophy, 280 students conferred their Bachelor's degree in Medicine. In Health Science, 21 students received their Doctorate in Pharmacy, 22 students received their Masters Degree, 51 students conferred their Bachelors Degree, 2 received their Post Basic Bachelor's degree. Followed by them, 795 students were given away their Masters degree in Business Administration. SRM University celebrated with pride the academic success of its exceptional graduands during the 10th Convocation hosted on 24 March, 2015 at the Dr. T. P. Ganesan Auditorium, Kattankulathur Campus. Dr. Harsh Vardhan, the honourable Minister of Science and Technology and Earth Sciences, Government of India, was the chief guest for the occasion. The Founder Chancellor, Dr. T.R. Paarivendhar, presided over the convocation ceremony. Dr. P. Sathyanarayanan, the President of SRM University, in the welcome address, noted that the university is proud for having played a crucial role in the educational and professional growth of the graduands. He requested Dr. Harsh Vardhan to adapt policies and frameworks that will treat private universities and educational institutions at par with government institutions. A synopsis of the annual report was delivered by Prof. Prabir Bagchi, the Vice-Chancellor of SRM University. He noted that at present, there are more than 1060 research scholars across 62 disciplines offered at the University. The University has also gained noticeable laurels for various innovations and product developments. Delivering the convocation address, Dr. Harsh Vardhan highlighted upon the current need to gain more sincere and dedicated citizens for the dynamic growth of the country. He encouraged graduands to develop out-of-the-box thinking and nurture dreams that may seem impossible but are actually feasible through hardwork and perseverance. He also said that the research based education method emphasized at SRM University is highly remarkable. According to him, Chennai is the 'intellectual capital' of India and with universities like SRM; it can progress to be the 'research capital'. The Convocation also featured conferment of honorary degree on Dr. Alur Seelin Kiran Kumar, Chairman, ISRO; Prof. Ashutosh Sharma Secretary, Department of Science and Technology, Government of India and Dr. Pradeep K. Khosla, Chancellor of University of California. Dr. Harsh Vardhan presented them with the Degree of Doctor of Science (Honoris Causa). Dr. Kiran Kumar, in his acceptance speech, pointed out on the importance of team work and the level of success it can yield. While Dr. Khosla told the graduands that they owe back the privilege that they have received; Prof. Sharma noted that the graduands in their multi-hued robes signify their invasion on different disciplines. HeDuring the 10th convocation, the University awarded degrees to 13617 candidates, including 9628 undergraduation, 3899 postgraduation and 90 PhD degrees which was followed by the administration of the pledge. Dr. Harsh Vardhan presented medals to the rank holders belonging to various disciplines such as engineering and technology, medicine and health sciences, management and science and humanities offered at the University. Graduands with colored robes were beaming with delight at Dr. T. P. Ganesan Auditorium, SRM University, Kattankulathur Campus during the 9th Convocation on February 9, 2014. The graduands were extremely happy to receive their degrees from the Chief Guest of the occasion, Shri Narendra Modi, the Honorable Chief Minister of Gujarat. The Chancellor, Dr. T. R. Pachamuthu delivered the welcome address. He thanked Shri Narendra Modi for his presence and he said that he is hopeful to see Mr. Narendra Modi as the Prime Minister of India for he has proved himself as a successful leader with his selfless services. He lauded Mr. Modi that he witnesses a culmination of many national leaders in him. He added that there are no religious, political or geographical boundaries in the University and he said he is very proud with the development of the University including close allies with many abroad Universities and many innovations. During the occasion of the 9th Convocation, Shri Narendra Modi also unveiled the portrait of Tmt. Valliammai, the mother of Founder Chancellor, Dr. T. R. Pachamuthu, SRM University. Dr. M. Ponnavaiko, the Vice Chancellor of SRM University read the annual report. He told the gathering that a total of 10,290 students from across all the streams and campuses are graduating this year. SRM University, known for 'Innovation' has filed 23 patents so far and two US patents have already been approved. He discussed the rapid developments of the University through the years including the nano satellite, other innovative projects and the MoUs of the University. Dr. Avinash Chander, the Scientific Adviser to Raksha Mantri and Secretary, Department of Defence Research and Development and Director General of DRDO was conferred the Honorary Degree during the 9th convocation. He has held many prestigious positions and he has been a recipient of many awards for his outstanding contribution including Astronomical Society of India Award - 1997, Agni Self-reliance Award - 1999, Dr. Biren Roy Space Science Award - 2000, DRDO Award of the Year 2007 and DRDO Technology Leadership Award in 2008. Dr. Chander said that he is privileged to share the dais with Mr. Modi. He said that he is proud of the latest developments in the country related to the field of defence. He also shared his concern about the threats to our country related to security and the solution he suggested is to keep the technology on the forefront for our armed forces. He congratulated the graduands and wished them to be independent thinkers and visionaries. The Director of each faculty presented the candidates for the award of the degree and the same was followed with the citation of pledge by the graduates. 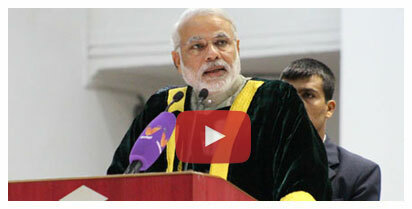 Mr. Narendra Modi then delivered the convocation address. He complemented SRM University, the largest private Universities of India for its outstanding contribution in educational sector and the meticulous dedication of the founder chancellor, Dr. T. R. Pachamuthu. He thanked the Chancellor for making him to unveil his mother's statue. He wished that all the graduates success in all the endeavors and for a contented life. 'Mr. Satya Nadella, CEO of Microsoft from Hyderabad is going places', he said. He added that he is assured that many such successful Indians are at SRM too and the young should aim to start companies like Google, Microsoft and Apple in India. He recalled the traditional educational system and he lauded them. He said that knowledge is wealth in this era to fight poverty and nothing could be replaced with knowledge. He said that he aims to establish IITs, IIMs, AIIMS in all the states of the country. He added that all Universities should be globally ranked and he congratulated SRM for being an example. The youngsters of this country want to live in a developed nation and Mr. Modi said that all Indians should work towards it. "Skill development is the need of the hour. We need to increase the speed, the pace in which the individuals and the organizations work and we should aim to scale up the development process", said Mr. Narendra Modi concluding his convocation address during the 9th convocation. Mr. S. Balaji of the Department of Mechanical Engineering, Graduate Engineering Trainee working with Coco Cola said he has come all the way from Ahmedabad only to watch Mr. Narendra Modi talk at his own campus. Mr. Arul Yogaraj, first rank holder of Civil Engineering - Part time said he is very happy to receive his degree from Mr. Narendra Modi. He said he worked when he studied and he added that his hard work has been paid off and he would cherish this moment for the rest of his life. The event then ended with the national anthem. It is indeed a day to remember and a moment to cherish for the graduating students of 2012 batch. The students were extremely happy as they witnessed the august presence of the Honorable President of India, Shri Pranab Mukherjee, His Excellency, Governor of Tamil Nadu, Dr. K. Rosiah and other esteemed guests on the eighth convocation held at Dr. T. P. Ganesan Auditorium on December 28, 2012. SRM University awarded Undergraduate, Postgraduate and Ph.D degrees to 8809 candidates. Revered Chancellor of SRM University, Dr. T. R. Pachamuthu invited the Vice Chancellor to deliver the welcome address and annual report after the invocation song. The Vice Chancellor of SRM University, Dr. M. Ponnavaiko explained the emergence of the global University, SRM since its inception as a matriculation school. He explained the various facilities of the University ranging from infrastructure to placement. He concluded his speech saying that the University has achieved many milestones and still needs to move forward to achieve the vision of the University. "To emerge as a World - Class University in creating and disseminating knowledge, and providing students a unique learning experience in science, technology, medicine, management and other areas of scholarship that will best serve the world and betterment of mankind". Dr. T. P. Ganesan, Pro-Vice Chancellor, Planning and Development introduced Dr. V. K. Saraswat to the audience. He stated that Dr. V. K. Saraswat is a fellow of many professional societies, recipient of many awards including the most respected title, Padma shree. In recognition of his achievement, SRM University conferred degree of doctor of science on Dr. V. K. Saraswat. Dr. P. Thangaraju, the Pro-Vice Chancellor, Medical introduced the honorary Degree recipient Dr. P. R. Goyal. He said that Dr. P. R. Goyal is a highly qualified medical professional and has specialized in many fields including allergy, immunology and chest diseases. He added that Dr. Goyal is always willing to share his knowledge and he remains a source of inspiration for all the young medical professionals. Recognizing his dedication and devotion to the people of India SRM University conferred the degree of doctor of science on the day of the eighth convocation. Shri Pranab Mukherjee, presented the honorary degree to both the recipients. Dr. V. K. Saraswat in his acceptance speech said that is a matter of pride to receive an honorary degree from SRM University. Dr. P. R. Goyal in his address said that the honorary degree is a matter of honour for not just the recipient but also for the profession of the recipient. Dr. Pawan Raj Goyal in his acceptance speech recalled the day he received his first degree in medicine on 24 March 1975 and he felt unexplained pride on that day. He said that he understood that it is not a degree but a responsibility and it reflects that how he has lived up to promise he has made to himself. "Health is a foremost requirement of happiness and I dedicate this honour to the most fundamental human right, enjoyment of human health. Live every moment with joy and happiness because life also has an expiry date just like medicines. ", concluded Dr. Pawan Raj Goyal. Dr. K. Rosiah in his address said that the graduands are blessed since they are from the renowned institute in the country. He maintained that the huge youth population of the country makes India a vast reservoir of human capital with huge manpower and brain power. Acquiring the skills and spirit of competitiveness is essential to face the challenges of the future. He concluded saying, "Wherever you are carry on the rich legacy of our nation". The Hon'ble president Shri Pranab Mukherjee delivered the convocation address. He said that it is a pleasure to be amidst brilliant young minds. He said that with the unlimited demands and limited resources, it is important that the private education sector to contribute more and enhance the development process. He expressed his concern that students and parents are skeptical about public universities. He said that to ensure their confidence, private universities need to constantly prove worthy and upgrade the facilities since higher education is a significant factor for nations development. He continued that credit system, examination reforms are yet to be in place for many educational institutions. His Excellency maintained that the Government of India aims systemic education to large number of people without diluting the quality of education. He added that the faculty members need to upgrade themselves with latest concepts in their respective fields by participating in refresher courses and seminars. He congratulated the University for the continuous success. The program then came to an end with the national anthem. SRM University witnessed with pride, the 2011 class graduating at the 7th convocation. The Governor of Tamil Nadu, His Excellency, K. Rosiah, chaired and delivered the Convocation Address at Kattankulathur on November 1, 2011. 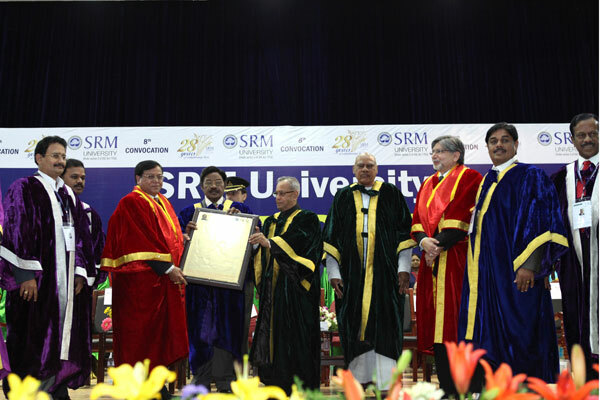 Konijeti Rosaiah, the Governor of Tamil Nadu was the chief guest for the 7th Convocation of the SRM University. Rosiah held prestigious positions like Minister for Finance, Power and Medical and Health in the Cabinet of Sri K. Vijayabhaskar Reddy from 1992 to 1994. Dr. M. Ponnavaiko, the Vice Chancellor of SRM University delivered the welcome address and presented the annual report. The Vice Chancellor said that the SRM University has always been kept up with the latest developments in Science, Engineering and Technology by designing new curricula and offering new courses that are relevant to the changing needs of the community and industry. He gave a brief up on the infrastructure, the research activities, research publications, SRM Satellite and various advisory boards. Stating the various sports achievements, events and services of the varsity, the Vice Chancellor concluded his speech by quoting, "SRM University will emerge as a leading world-class institution that creates and disseminated knowledge. Along with academic excellence, our curricula emphasize to create true human resource with integrity and cultural sensitivity so that our graduates may best serve the nation and the world." Dr. Subra Suresh, Director, National Science Foundation (NSF), United States of America was conferred a degree of Doctor of Science in appreciation of his outstanding achievements in the field of material science, biology, engineering education and for championing the cause of women and minorities and in recognition of his vision, dedication, devotion and contribution to the cause of science and society. In the acceptance speech, Padma Shri Dr. Subra Suresh, said that the students at SRM are encouraged to innovate and compete in the ever changing world. His Excellency, Dr. K. Rosiah, in his convocation address congratulated the SRMSAT team for designing a nano - satellite which would monitor Greenhouse Gases in the tropics. He added that it is a matter of pride not only to SRM, but also to the entire students' community. He quoted Sir. C. V. Raman's lines, "Research is civilization and determines the economic, social and political development of a nation". He appreciated the initiatives taken by the SRM's international advisory board to build an international dimension in all aspects of education. The Chief Guest of the occasion, K. Rosiah conferred the doctorate degree for the research scholars and he presented medals to the rank holders of various engineering streams. The chancellor Mr. T. R. Pachamuthu recited the pledge and declared the convocation closed. The programmed ended with the national anthem. "Graduation is a time of completion, of finishing, of an ending; however, it is also a time of celebration of achievement and a beginning for the new graduate." With happy faces all over the campus the SRM University, Kattankulathur was a place of delight during the special convocation on November 11, 2011. Shri Ghulam Nabi Azad, Honourable Minister of Health and Family Welfare, was the Chief Guest of the grand ceremony. Shri Ghulam Nabi Azad held different ministerial positions and he is well known for his remarkable political career. Dr. M. Ponnavaiko, the Vice Chancellor of SRM University welcomed the parents and the graduating students. Congratulating the first batch of MBBS students graduating from the Varsity, the Vice Chancellor continued to present the annual report. He highlighted the infrastructure of the different campuses of the University. 3120 post graduate students graduated from the Faculty of Engineering and Technology, Faculty of Medicine and Health Sciences and Faculty of Science and Humanities and 797 students graduated from the dental college, medical and paramedical courses. Shri Ghulam Nabi Azad congratulated the University for functioning with social commitment, recognizing the need of the nation to equip the students to meet the global challenges and to succeed in a global competitive environment. The Union Minister maintained that he has instructed the Medical Council of India to increase the faculty student ratio from 1:1 to 1:2 to meet the shortage of medical professionals in the country. He added that he is happy that the private institutions like SRM University support the government in sharing the burden to fund the higher education. Advising the graduates during the grand occasion, he mentioned that the nation needs active participation of young people in fighting the maladies which takes a huge toll on the rural population of the country. He appreciated the successive governments of Kerala and Tamil Nadu for the strides made in the health sector and he said that the health indicators like MMR, IMR and TFR of the above states are comparable with any developed country. © SRM University, India. All rights reserved.